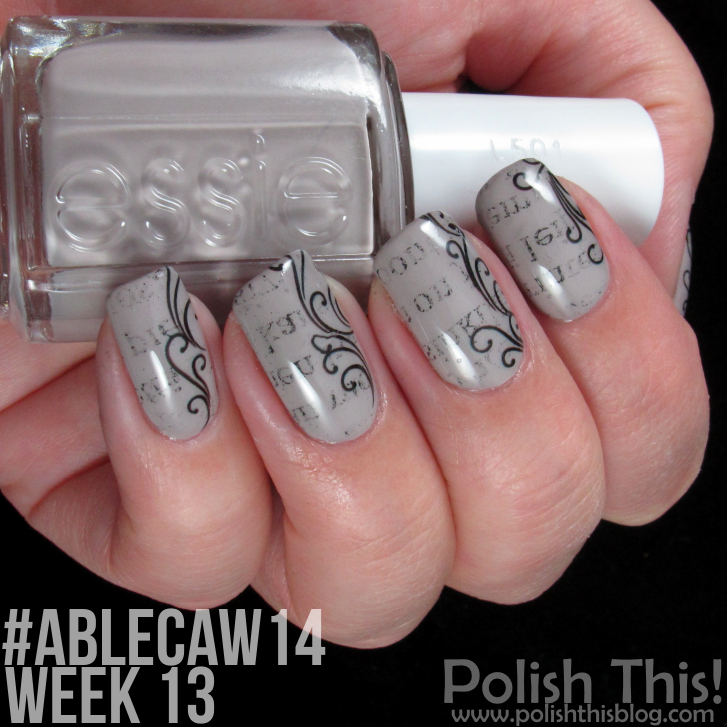 #ablecaw14 Week 13: My Profession - Polish This! From the beginning of our Finnish(able) Nail Art Challenge this was probably the theme I was most afraid of. It just that I wasn't so sure what I would do for this theme and I felt like the theme wasn't the most inspiring one. But that's of course the beauty of the challenge too, it challenges you to do something that you normally wouldn't even think of. The other reason why I wasn't feeling too excited about the theme My Profession, is probably the fact that I don't really have a specific profession yet eventhough I have already graduated from the university. My degree is a general one and so it doesn't directly give you any profession, and as the situation in the society is what it is, I haven't really found the job for me yet, I have just been doing some shorter periods in different jobs. Soooo in short I'm not really able to even say what my profession exactly is and that makes this theme quite hard to do. However, I thought this would be the perfect opportunity to try newspaper nails technique, since I haven't done newspaper nails yet and I thought they might suit this theme for me the best. Every one of my jobs have required something to do with text, and I'm pretty sure my profession will always include texts in some form, so nails with text are really the perfect thing for this theme for me. I used Essie Take It Outside (2 coats) as my base color. Then I did transfered the text from pieces of magazine on my nails (you can find many good tutorials about this, just google newspaper nails). After applying one coat of top coat I also finally added some water decals as the plain newspaper nails looked a bit dull. I was actually planning on stamping something over the newspaper base, but as I'm still a bit sick, I thought I should keep it as simple as possible, so I used the water decals. I had some difficulties with the text not transferring on my nails, but at least I managed to get some letters on my nails. Also the water decals weren't the best quality and they wanted to do everything else than behave nicely, so they aren't as neat as I would have liked them to be. Nevertheless, I really liked this manicure and at least I managed to do a decent mani for this theme! I also took a picture without the water decals, but like I said, I felt like the nails looked a bit boring with the text only and I'd say I preferred the manicure with the water decals. How about you guys, how'd you do your profession on your nails? I am so completely in LOVE with this mani! I have to try it!! I tried this technique a few times, with a magazine and liked the way it turned out. Pity I don't have for nail art these days. Hehee, tekstityöläiset näyttää ajattelevan vähän samoilla radoilla, mun ammattikynsistä tuli aika saman henkiset ;) Nää sun on kyllä tosi hienot ja herkät! Mulle tää ei ollut vaikea vaan ennemminkin inspiroiva haaste, kun tekstikynsistä kovasti tykkään. Sen sijaan se mustavalkoinen esim. tuotti yllättäviä ongelmia - koskaan ei voi tietää, mikä onkin hankalampi haastekohta! Kiitos paljon, kiva kuulla, että tykkäsit näistä! :) Jep, ei sitä kyllä aina ennakkoon tiedä mikä haaste tuntuukin hankalammalta, nämäkin tuli sitten kuitenkin tehtyä suht vaivattomasti. Ehkä usein pelkät värihaasteet tms. saattavat olla hankalampia, kun niihin voi periaatteessa tehdä mitä vain, kunhan noudattaa annettuja värejä. Actually I love the "fading" effect of the letters, they match perfectly with the decals...It's really a pretty manicure!! Mulla sama "ongelma" kuin Papulla (- kerran kokeilleena vain). Kauniit kynnet oot tehnyt!